Q: How many children’s authors can you cram into one room? A: Thirty-four. Yep, 34! 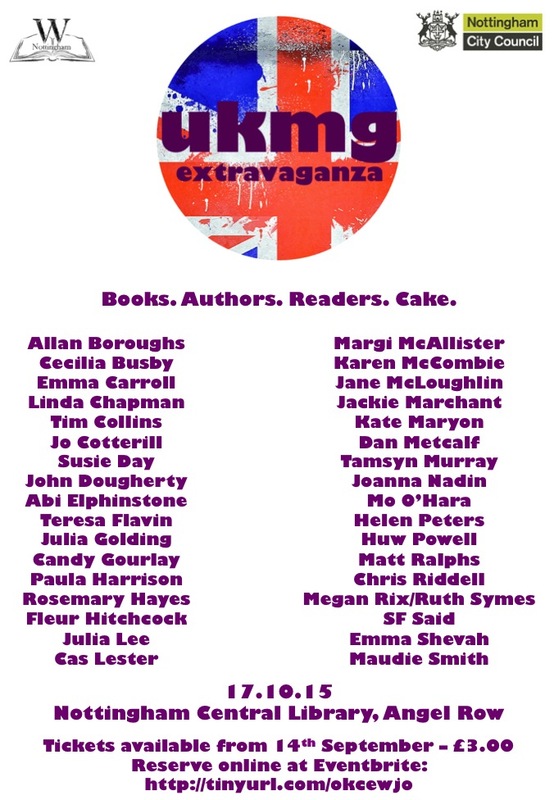 Well, that’s how many are descending on Nottingham Central Library tomorrow (Saturday 17 October), because it’s the first ever UKMG Extravaganza. ‘MG’ stands for Middle Grade, the American term for books aimed at lovely people aged anywhere between the ages of 8-12 (ish). I’m going (hurrah! ), along with a ton of other lovely Girls Heart Books bloggers past and present, like Jo Cotterill, Jo Nadin and Susie Day, and star of the show is this year’s Children’s Laureate, the stupidly talented Chris Riddell. Looky-looky – shed-loads of authors!! It should be a fantastic day for the book fans of Nottingham, but it’s going to be a pretty fantastic day for us authors too. Most of the time we work in isolation, but now we can come out of our writer caves, blinking in the light, and meet others like us. AND there’s apparently going to be lots of cake. It doesn’t get much better than that! Anyway, I must go and prepare (ie try and find my train ticket, check that my favourite jeans aren’t in the wash and e-mail Tamsyn Murray ’cause we’re travelling up together). And do check in on the Girls Heart Books blog next week. I have a feeling there’ll be a UKMG Extravaganza report! Sounds fab – wish I was going!